The Indian Association of Dermatologists, Venereologists and Leprologists (IADVL), the largest representing society of Indian Dermatologists is now enjoying its full youth. IADVL was established in its present form on 28th January, 1973. The Indian Association of Dermatologists, Venereologists and Leprologists (IADVL), the largest representing society of Indian Dermatologists was established on 28th January 1973. It is presently in its youthful days. In 1940, Bombay Association of Dermatologists and Venereologists was formed, with two more chapters, i. e. Madras and Calcutta. 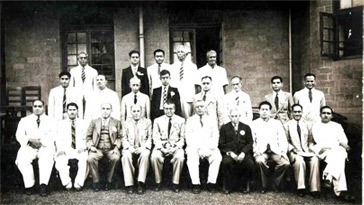 In 1947 the 1st Congress of Indian Dermatologists met in Bombay, which was presided over by Dr. R. V. Rajam. The 2nd All India Conference was held in 1951 at Calcutta, which was presided over by Dr. A. C. Rebello. At this Conference, a resolution was passed to merge all the three separate chapters, i.e. Calcutta, Madras and Bombay, into one under the umbrella of ‘The Indian Association of Dermatologists and Venereologists (IADV)’. The Founder President of IADV was Dr. A. C. Rebello and there were a total of only 24 members of the Association. Dr. A. C. Rebello in his presidential address had mentioned that post-graduate teaching in dermatology started with “The First Chair ‘in Dermatology being established in 1907 at J. J. Hospital and G. M. C., Bombay. Late Major C. Fernandez was the first Indian Chairman of Dermatology Department. At that time, only outpatient facility existed. In 1921, in Calcutta, under the guidance and Chairmanship of Late Col Acton, a Skin Research Department with various units (including Mycology) was established in the School of Tropical Medicine and Carmichael Hospital for Tropical Diseases. In 1926, a one-year diploma course in Dermatology (presently known as DVD) was started at KEM Hospital under Bombay University and by 1951, many major teaching hospitals and universities in India had established posts of Lecturers in Dermatology. Dermatological Society, India (DSI) came into existence in Calcutta in 1960 after the All India Dermatological Congress at Calcutta under the Chairmanship of Maj A.M Chakraborty with Dr. J. Majumder as the Organizing Secretary. The first President of DSI was Dr. S. Rajagopalan. Dr. K.D Lahiri became the first Honorary General Secretary and Dr. S.C. Mitra the first Honorary Treasurer. The 1st Asian Congress of Dermatology was organised in Madras (Chennai) in 1970 by Dermatological Society of India(DSI) under the Chairmanship of Prof A S Thambiah. The Organizing Secretary was Prof M. Natarajan . Till 1973, we were a part of Association of Physicians of India (API) and our conference used to be part of APICON. Dermatology as a specialty did not receive much boost during this stage. With a view to merge the two societies of Dermatologists, the official representatives of the Dermatological Society, India (DSI) and The Indian Association of Dermatologists and Venereologists (IADV) met at Calcutta on the 20th August 1972 in order to formulate the broad principle for the amalgamation of the two existing associations of Dermatologists. It was unanimously agreed to amalgamate both the associations. On 28th January, 1973, finally at a joint meeting of Indian Association of Dermatologists and Venereologists and Dermatological Society of India at Udaipur, a unanimous decision was taken to amalgamate these two bodies into one, and it paved the way for the birth of Indian Association of Dermatologists, Venereologists and Leprologists (IADVL).. A new Constitution was drafted thereafter and the office of IADVL was established at Delhi. The first President of IADVL was Dr. B. N. Banerjee (Late) and first Hon. General Secretary was Dr. L. K. Bhutani (Late) Since then, year after year, IADVL has marched ahead very enthusiastically and emphatically under the dynamic leadership of various respective Presidents and Hon. General Secretaries. IADVL was registered at Lucknow on 8th May, 1975 under the Societies Registration Act (21 of 1860) vide Registration No. 270-1975-76, No. 760/1-35960/Lucknow, dated 19-5-1975. Dr. S.B. Mondal designed the logo of IADVL. The significance of the logo is as below: The left inner circle contains a histological picture of epidermis and dermis signifying Dermatology. Cupid is the God of love (Kamadeva). The Cupid’s bow at the bottom indicates Venereology. Rays of hope radiating from flower petals on the right implies the joy and ecstasy after coming out from the agony and humiliation of Leprosy. The Hippocratic symbol superimposed on a map of India indicates that the association will spread to every nook and corner of this country. Now, we all know that our specialty has progressed relentlessly and also enjoys very good reputation. Our Association has over-seas membership too. Important characteristic feature that of our membership is an Honorary member. We may admit eminent and outstanding Dermatologist, Venereologists and / or Leprologists or specialists of allied branches with national and international reputation either of Indian or other origin, as an Honorary member. According to available information, the Constitution of IADVL was first printed in 1992 and then subsequently in 1996, 2000 and recently in 2006. The following members have rendered services as the Presidents, Hon. General Secretaries and Hon. Treasurers of IADVL. PRESIDENTS: Dr. B. N. Banerjee (Late)(1973), Dr. B. M. Ambadi (Late)(1974), Dr. C. Sobanadri(1975), Dr. Gurmohan Singh(1976), Dr. T. V. Venkatesan (Late)(1977), Dr. Brig. T. R. Chopra(1978), Dr. B. M. S. Bedi(1979), Dr. S. R. Sadana(Late)(1980) ,Dr. L. K. Bhutani(Late)(1981), Dr. T. Gopinath(1982), Dr. A. Krishna(1983), Dr. L. Marquis (Late)(1984), Dr. F. Handa(1985), Dr. R. K. Dutta(1986), Dr. D. K. Gupta(1987), Dr. R. K. Panja(Late)(1988), Dr. M. A. Wali (Late)(1989), Dr. K. Siddappa(1990), Dr. B. Narsimha Rao(1991), Dr. V. N. Sehgal(1992), Dr. S. K. Panja(1993), Dr. R. G. Valia(1994), Dr. R. P. Okhandiar(1995), Dr. J. S. Pasricha(1996), Dr. Kalyan Banerjee(1997), Dr. Jayakar Thomas(1998), Dr. Rishi Bhargav(1999), Dr. Ganesh S.Pai(2000), Dr. Bhushan Kumar(2001), Dr. K. K. Rajababu(2002), Dr. A. K. Bajaj(2003), Dr. Rui Fernandez(2004) ,Dr. V.P. Kuriyipe(2005) ,Dr. Suresh P Joshipura(2006), Dr. Chetan Oberai (2007), Dr. S. Sacchidanand (2008). Presently the President is Dr. V. K. Sharma (2009)and the President elect is Dr. Hemangi R. Jerajani. HON. GENERAL SECRETARY: Dr. L. K. Bhutani (Late), Dr. N. C. Sethi, Dr. K. Siddappa, Dr. A. D. Dharmaratnam, Dr. A. K. Chakrawarthy, Dr. Brijesh Agarwal, Dr. Deepak Parikh, Dr. Dinesh G Mathur, Dr. Suresh P. Joshipura, Dr. Amarkant Jha Amar, Dr. S. Sacchidanand and Dr. Koushik Lahiri. Presently the Honorary General Secretary is Dr Rajeev Sharma for the years – 2008 and 2009. HON. TREASURERS: Dr.N.C. Sethi, Dr. N. A Karibasappa, Dr. S.B. Mandal , Dr. R. M. Parmanand , Dr. Asit Mukherjee , Dr. Uma Shankar Agarwal, Dr. Chetan Oberai, Dr. Janak K. Thakkar, Dr. Prasoon Kumar Roy and Dr. S.D. Nagendra Guptha and Dr. Arijit Coondoo. Presently the Honorary Treasurer is Dr. Roopak Saxena for the years 2008 and 2009. In 1935-36, a journal named ‘Indian Journal of Venereal Diseases’ was released, which was edited by Dr. U. B. Narayan Rao . In 1940, the name of the journal was changed to ‘Indian Journal of Venereal Diseases and Dermatology’, having four issues a year. As per data available and to the best source of knowledge, till 1955, Dr. U. B. Narayan Rao ran The Indian Journal of Venereology and Dermatology on proprietary basis. On 31st March, 1955 the Journal became official publication of the Association, having three editors: 1) Dr. G. Panja, Dermatology Section; 2) Dr. R. V. Rajam, Venereology Section; and 3) Dr. U. B. Narayan Rao , Managing Editor. The first official issue of the Journal started in June, 1955. Dr. U. B. Narayan Rao passed away in 1960. After his death, Dr. T. K. Mehta took over as Managing Editor. The following luminaries have rendered services as Chief Editor of IJDVL through different years: Dr. S. C. Desai, Dr. Bhaktavizam, Dr. (Mrs.) Rachel Mathai, Dr. J. S. Pasricha, Dr. S. G. Despande, Dr. Gurmohan Singh, Dr. K. Pavithran and Dr. Uday Khopkar. Presently, Dr. D.M. Thappa is the Chief Editor of IJDVL. The Journal, IJDVL in recent years has witnessed phenomenal change both in quality and impact factor. The www.ijdvl.com is in place since May 2003. It is an open access journal website with very high number of hits. IJDVL has been indexed in Index Medicus since January 2006. Since 1973 the venues of various National Conferences of IADVL have been as under: Udaipur(1973), Patna(1974), Trivandrum(1975), New Delhi(1976), Ahmedabad(1977), Calcutta(1978), Srinagar(1979), Goa(1980), Indore(1981), Hyderabad(1982), Mangalore(1983), Aurangabad(1984), Cochin(1985) Jabalpur(1986), Pune(1987), Calcutta(1988), Mumbai(1989), Jaipur(1990), Vishakhapatnam(1991), Patna(1992), Manipal(1993), New Delhi(1994), Madras(1995), Ahmedabad(1996), Guwahati(1997), Chandigarh(1998), Bhubaneshwar(1999), Bangalore(2000), Agra(2001), Kochi(2002), Kolkata(2003), Mumbai(2004), New Delhi(2005), Hyderabad(2006), Chennai(2007), Chandigarh(2008) and Bangalore (2009). As per a resolution of IADVL General Body all National conference of IADVL is now known as DERMACON, all state conference as CUTICON and Zonal conference as DERMAZONE. Gujarat State Branch under the Editorship of Dr. B. C. Kamdar, the President of IADVL Gujarat State Branch with the help of Dr. L. P. Ghodasara, Hon. Secretary in 1987, first published All India Directory of members of IADVL at a remote place like Rajkot with meager facilities. At that time modern facilities of computer, and computer-based printing technology was not available and everything was to be managed manually. Subsequently, Dr. Suresh P. Joshipura as the then Honorary General Secretary published another updated directory in 1998. Then in 2000 Dr. Amar Kant Jha Amar published an edition and in 2004 another edition was published by Dr. S. Sacchidanand. The last edition was published by Dr. Koushik Lahiri in 2008. This new edition of IADVL Directory (updated up to December 2007) contains the details of almost 5000 life members of IADVL. The IADVL has first published ‘IADVL Textbook and Atlas of Dermatology’ in two volumes under the Editorship of Dr. R. G. Valia in 1994. The object to publish above textbook was to fill a lacuna in our postgraduate teaching of dermatology. This book has been specially prepared keeping in view the Indian and Third World perspective. The first edition of the book received tremendous response, therefore, considering the need of the time, IADVL has published 2nd updated edition of the Textbook in 2001. The third edition has been released finally in 2009 during the DERMACON 2009. IADVL has been receiving the royalty amount obtained by the sales of this textbook. Every year IADVL offers various training fellowships and young members receive various International scholarships through IADVL. In 2001 IADVL website (www.iadvl.com) was initially created by Dr.Kuriyipe / Dr.P.V.Mathew / Dr.S.Criton before the 30th National Conference of IADVL held at Kochi, Kerala. (2002). this contained a lot of preliminary information about IADVL as well. Once the conference got over, the Website was retained. More inputs were added for the same. Under the guidance of Dr. K. K. Rajababu & Dr. A. K. Bajaj and with the help of the Editor of IJDVL Dr. Uday Khopkar, Honorary General Secretary Dr. S. Sacchidanand and the National Executive body strengthened the IADVL Website with additional information and features. Less than 25% of its members were computer savvy by then. Dr. V. P. Kuriyipe, sensing this aspect, embarked upon an ambitious project of purchasing one lap-top for every dermatologist in the country. Initially it received a tremendous response, but ultimately around 400 Dermatologists purchased it. However this sensitized all the members and the number of hits to the IADVL – Website increased gradually. By the end of 2005, the website was more informative and interactive. In 2006 under the leadership the then President Dr. Suresh Joshipura and Honorary General Secretary Dr. Koushik Lahiri a full fledged IADVL-Website committee was formed and the official new website www.iadvl.org was launched during CC MIDERMAMEET 2006 at Hyderabad on 6th August. This is a dynamic and interactive site loaded with all the information about IADVL and its branches and all the forthcoming conferences, workshops both within and outside the country with information about all awards, prizes, scholarships etc. The whole IADVL Directory can be searched online. A member can read the entire IADVL Constitution and all the IADVL NEWS Letters online. The process of online updating of members? address is another very useful feature. The IADVL Secretariat and the Chief Editor of IJDVL get the information instantly. In short the new and updated official website has completely revolutionized day to day administrative works of the association and ushered in e-governance in the works of IADVL. With several e-groups (academic, general and others) under its banner, and keeping pace and rhythm with the recent communication revolution, IADVL has developed a very user-friendly system and has evolved as a modern, dynamic, responsive and resonant organization. The member countries of South Asian Association for Regional Co-operation (SAARC) have formed an Association for the Dermatologists, Venereologists and Leprologists and are known as South Asian Regional Association of Dermatologists, Venereologists and Leprologists (SARAD). IADVL has become an active member of SARAD. Now, the scope of our activities will expand vigorously across the boundaries of India. IADVL is now a very important member of International League of Dermatological Societies (ILDS) with one of the biggest representation among all the dermatological associations / societies from across the globe. For the first time in the history, a member of IADVL, one of the past Presidents Dr. Chetan Oberai has been elected to the Board of Regional Directors of ILDS representing South Asia, Middle East and Africa (SAMEA) region. Let us hope that we, in present and our future generations, will continue the glorious tradition of IADVL and render better services to all the members and society at large. Compiled by: Dr. K Siddappa, Davangere, Dr. Deepak Parikh, Mumbai Dr. Suresh P Joshipura, Rajkot, Dr. S. Sacchidanand, Bangalore, Dr. Koushik Lahiri, Kolkata, and Dr. Rajeev Sharma, Aligarh.